Tips on Planning a Catholic Wedding Ceremony[/caption] Marriage is the most significant lifetime experience of a person. Everyone wants to make their Wedding Ceremony memorable, pleasing, and spectacular. Making a wedding ceremony perfect is however a challenging as well as a daunting task. Catholic Wedding Ceremony is a religious affair which has certain strict rules and regulations that must be remembered while planning your perfect ceremony. 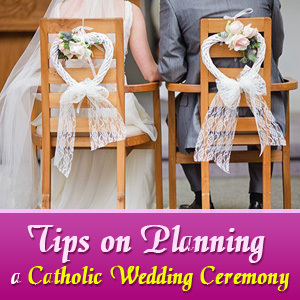 Here are some general suggestions on how to plan a Catholic Wedding Ceremony. Start your wedding preparation by choosing a parish in which you wish to have your wedding. It is always better to book a date and the location of the ceremony with the right priest or church officiator as soon as possible. You have to make a decision regarding the form of the Wedding Ceremony. Catholic Church has two different rites of marriage, and that are celebration within the Catholic Mass or outside the Mass. The choice depends on whether you and your partner are baptized Catholics or not. Choose the appropriate Scripture Readings, Biblical Passages and Hymns that you want to recite during the ceremony. Many priests also allow some blessings and personalized vows that can make you feel highly special. The right choice of music can add grace and elegance to a wedding ceremony. Hire a professional to select a range of pleasing songs that can be played when you walk down the aisle. The wedding dress is an important aspect of a Wedding Ceremony. Every bride wants to look gorgeous and dazzling in her wedding gown. It is advisable to choose an appropriate Wedding dress which is elegant and it shouldn't disrespect the modesty of the Church. You can choose your friends and relatives to perform different rituals during the ceremony. A maid of honor, the best man, blessing readers and the distributors of gifts and Holy Communion are some of the considerable options to make your family and guests feel honored. You can also consider some additional elements to enhance your wedding ceremony. Background about the couple and the immediate family, and the details of the reception and Communion can be included in the program. Meaningful, careful planning and preparation can provide you an unforgettable and overwhelming experience to the blessed couple. So what are you waiting for? Go ahead and plan your perfect and delightful Catholic Wedding Ceremony!